This is a SM101 SKOVBY multi function table. It can be used as an extra table for guests table, or you can use it as a counter in your office when no guests are around. This Multi-Function Table is 70" long when open, 43" when one leaf is up, or 15.75" when used closed as a sideboard or counter. Leaves are built with hydraulics for easy lifting and the center contains storage with wire shelving built in. Even better, the center has a top that flips from wood to metal for putting hot plates on! It clearly demonstrates Skovby’s commitment to design as well as function. 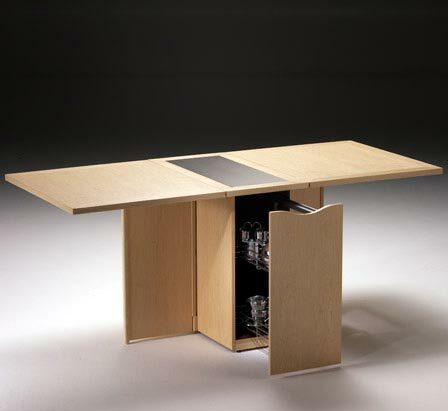 The side storage, reversible table top, and double drop leaf design make it the perfect solution for any office space. Smith Interiors Ltd. was formed in May 1997 and is a combination of the former Bronson Interiors Ltd. and Seymour D. Smith Inc. We are direct importers of contemporary Scandinavian, Italian, German, and French furniture and accessories that combine good design and quality craftsmanship. We offer everyday low prices both in our 10,000s/f showroom and on our website, and we offer delivery or shipping anywhere in the country. I am doing some research on multifunctional furniture and wanted to know how much this table would cost. And how long does it take to manufacture.